Another video showing off a modded car to assist parallel parking. Noisy solution though based on the screeching sound I heard on the video. I like this. Most of my power plugs are double pronged, and this might work for me. A single power socket can power up 6 of my “gadget” chargers … Palm T3, Nokia 9500 commie, LG Chocolate mobile, Bluetooth headset, AA NiMH battery charger, Kodak DX6490 digicam …. yup! that’s six. It has a built in surge protector to boot. The price at $20 (around RM70-RM80) is reasonably, not much different from the China made extension cords with built in surge protector i’m using now. Where can I get this in KL? This one here looks way cooler, and more useable than the insect looking design I posted earlier. The designer, a student from Vietnam, gave it the name Capella. He, claims when folded, the electric bike could be backpack size, and tips the scale at 22 pounds (10 kilograms). That seems a manageable weight to be carried on a backpack. The prototype has a range of 12 kilometers, not very far but that could be improved before final froduction, right? Now the wait for this bicycle to me mass marketed. I’m not really a fan of G-Shock watches, but these Gumby, robot like G-shock characters is cool. Don’t know if it tells time, it would make a great desktop clock. The characters designed by Shiro Nakano, marks the 25 years of Casio G-Shock watches in the market. CrunchGear posted another electri powered bicycle. This time the design is more traditional and conservative, compared to the one I posted a few days ago. This one, by Yamaha, is powered by a lithium ion battery and a full charge can power the bike uo to 67 kilometers. When the juice runs out, I don’t know if pedalling the bicycle would recharge the battery. It would be a great green vehicle if we could charge the batteries by converting the kinetic energy to reserved electrical energy. When you are tired, flip the switch and let the motor turn the wheels. 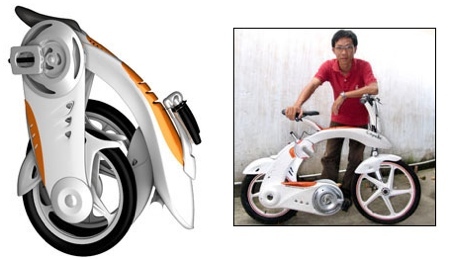 The bicycle being very popular in Japan, could mean these electric powered bicycle have a good chance there. You’ll have to wait a while. This piece of awesome gadget is still in rumour stage, though the rumour seems to come from very strong sources. There could be a model in 9 inch display as well … WOW! A mini tablet computer from Apple, that’s what I’d categorize it. If this were true, we would be seing this in Sep-Oct 2009. The pricing must be right, otherwise these future models are going to fiercely compete with the netbooks. Leave it to the Japanese to materialize what had beed drawn in Japanese manga comic books since I was a schoolboy. This one is an eksoskeleton of sorts that helps ordinary people have extraordinary powers for certain jobs. Has application for medical purposes too. Hmmm … Steve Austin in the making maybe.